Course of Theoretical Physics, Volume 6: Fluid Mechanics discusses several areas of concerns regarding fluid mechanics. 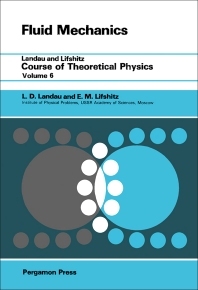 The book provides a discussion on the phenomenon in fluid mechanics and their intercorrelations, such as heat transfer, diffusion in fluids, acoustics, theory of combustion, dynamics of superfluids, and relativistic fluid dynamics. The text will be of great interest to researchers whose work involves or concerns fluid mechanics.